Tiny Tots Prestatyn – Since 1972! Tiny Tots is a pre-school day nursery with an Out of School unit within the grounds, providing quality care to children and babies of all ages. 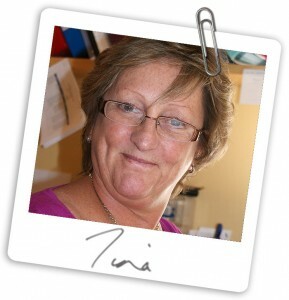 Tiny Tots also runs an out of school facility within Trelawnyd VA School, which opened in September 2005. 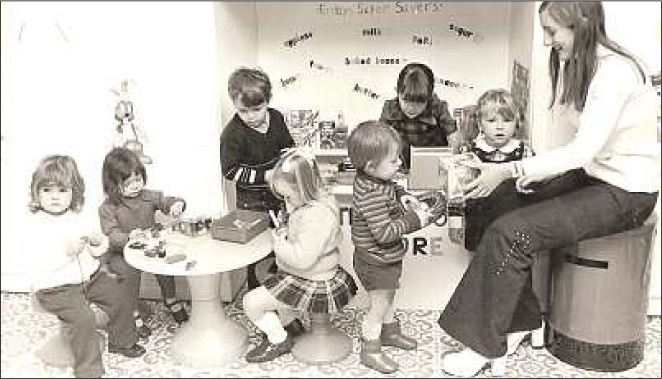 In this black and white photograph from the 70’s, Tiny Tots’ owner Tina Jones leads playtime. The Nursery was opened by myself in 1972 and until May 1995 only operated on one level. Since then, after a major expansion programme the nursery now operates on two levels, to include a superb self contained baby unit and toddler areas on the upper level and pre-school play areas on the lower level. This enables us to provide a greater variety of activities and a wealth of opportunities and experiences. The aim of the nursery is to provide a happy, safe and caring environment for young children to develop in, enabling them to progress confidently towards entering mainstream school. Within the nursery they have the opportunity to mix with other children while being educated through play in relaxed surroundings that are beneficial to their development. 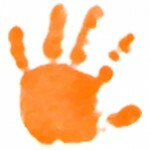 We provide an extensive variety of different activities, experiences and resources to aid the children’s learning. 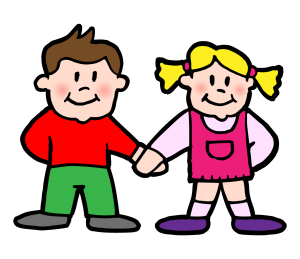 The nursery is registered under the Children’s Act 1989 with the Care and Social Services Inspectorate Wales (CSSIW) to take young babies and children up until statutory school age on a full or part time basis. 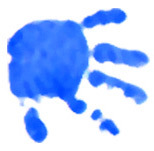 Tiny Tots is also registered with Estyn to provide LEA funded early year’s education (Foundation Phase) as well as care to the children attending our nursery school. This scheme has been set up by the Welsh Assembly to provide free part time education for all three year olds for the parents who want it. The scheme runs from January to July allowing children to join this group the term after their third birthday. The group known as Blue Group is run by Vicky, Sirena and Sam. Also involved is a peripatetic teacher from Denbighshire LEA, who visits Tiny Tots on a weekly basis to share her early year’s skills. All the areas of learning are delivered through play centred activities and experiences. It is well planned and carried out by a qualified and experienced team, motivated to ensure all children benefit while developing their social skills and learning through the medium of play. Because of this funding we are inspected by Estyn in the same manner as Mainstream Schools. The nursery is set in its own grounds, with a large garden and play areas to the rear giving the children ample space and freedom in which to safely play, especially during the summer months. Beyond the garden we have the play area for toddlers and preschool children, fully equipped with large and small equipment which includes climb on, crawl through, ride on toys to name a few. Beyond is a second playground for the older children and is equipped with an all wood playground at one end and a football pitch at the other, giving the older children more opportunities and space for outdoor play.